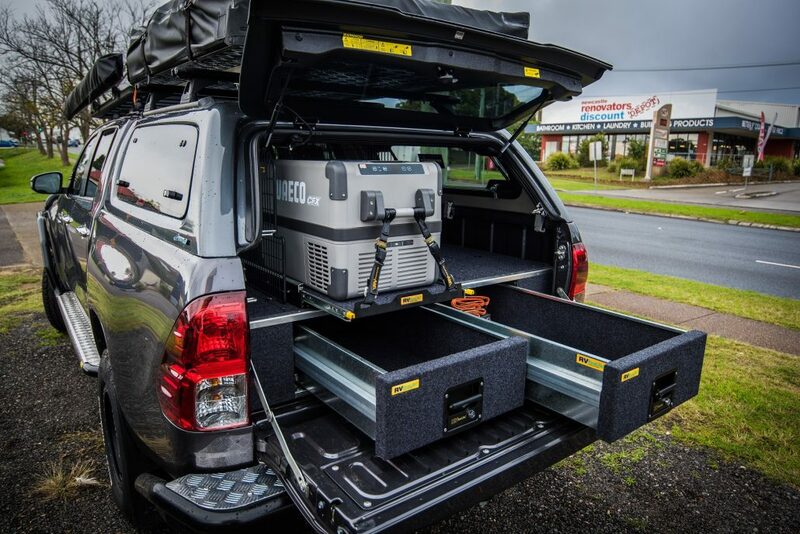 We like to showcase our gear on the country’s best selling 4WDs so when the need for a new company vehicle arose, it was a no-brainer – we just had to have a HiLux. 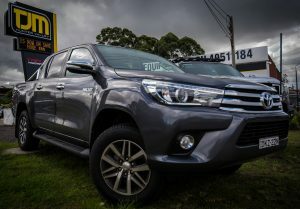 The battle for best-selling 4WD rages fiercely between the Ranger and HiLux so with a Ranger already safely nesting in our shopping cart we decided to cover all our bases and grab a new graphite coloured HiLux. 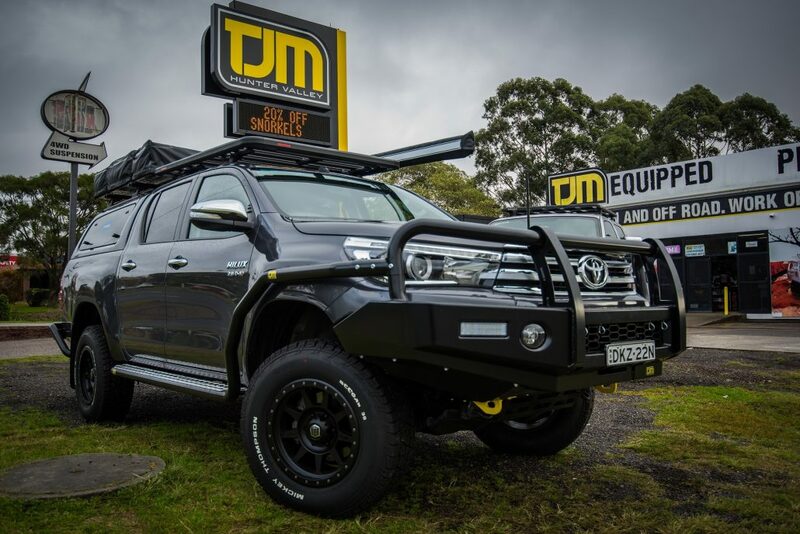 For those that know us here at TJM Hunter Valley, you will know that this Hilux was never going to stay stock-standard for very long. We started by lifting the Hilux 2 inches all round using the TJM Series 4000 suspension. Shock absorbers are a 40mm bodied, nitrogen gas strut and coils are designed to our specifications and manufactured by King Springs. We threw in a set of 300kg leaf springs in the rear to account for the extra weight carrying duties we had in store for it. Full bar work was in order for the Lux and at the front we started it out with the T13 Outback bull bar which has an improved air-flow design for the new model Hilux and fat looking 63mm top tubing. Protecting the sills and front quarters are a set of side-steps and brush bars which is carrying over the 63mm tubing and offering great protection and easy access via the wide checker-plate tread steps. The bar work was finished off with the RB6 rear bar which incorporates an ADR compliant heavy-duty tow bar and accommodates the SR-5’s rear parking sensors. Up-top is a Yakima Lockn’Load platform which is a new and unique design by Yakima using east-west running slats to improve weight distribution, give better accessory options and provide more tie-down points. We’ve fixed the Darche Eclipse 2×2.5m awning to the platform to give us some protection from the elements whilst out and about. 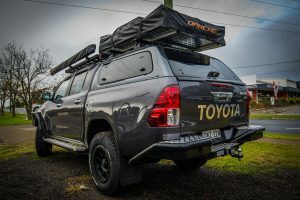 The Hilux was built with touring and camping as the priority and nothing beats a good canopy for keeping your gear safe from the elements for ute owners. We’ve fitted the Aeroklas canopy to this Hilux and as far as canopies go, they don’t get much better. 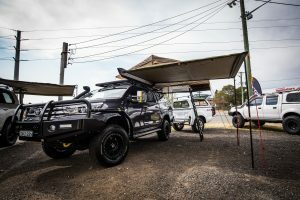 The double skinned ABS canopy is not only tough, but looks the goods and one of its best features is the low-profile roofline that follows the same line as the vehicle. This keeps the overall height down which makes accessing the Darche Highview 2 roof top tent on top of the canopy just that little bit easier. Underneath the canopy is a set of RV Storage Solutions EcoLite storage draws, fridge slide and fridge barrier. We’ve sold our fair share of rear storage draw systems over the years but the new range from RV Storage Solutions are some of the best we’ve come across. The finish is superb, there’s a great variety of layouts and options and the roll on those draws themselves, is silky smooth. 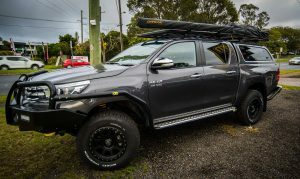 We’ve now set the new Hilux up as the ultimate tourer with self-sufficient camping in mind. As far as company vehicles go, the boys look forward to weekend trips away and for our customers, it’s great to be able to show them the products fitted to a vehicle in the flesh rather than just in a catalogue or on the shelf. If you’re in the market for a new Hilux and are looking for some ideas to inspire you, come on in and check ours out.